Replacing a car battery is not a task many folks enjoy. Batteries are heavy, expensive and they rarely fail at a convenient time. The mild winter experienced by most of the country went easy on batteries, but the heat wave that has been sweeping the nation this summer is putting a serious hurt on many car batteries. The damage being done by the heat of summer often isn't manifested until the first cold snap of the year, but it's beginning to look like a lot of folks are going to be replacing batteries this winter. We'd like to offer some tips that will help you extend the life of the battery you currently own and maximize the life of your next battery. 1. 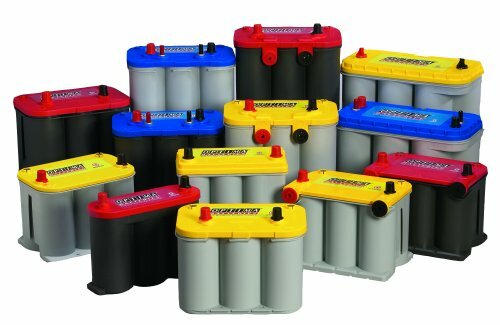 Choose the correct type of battery for your application. The majority of vehicles on the road today do just fine with an SLI (starting/lighting/ignition) battery, like our REDTOP. However, some vehicles place more demands on their electrical system and require a battery designed for deep-cycle use, like our YELLOWTOP. These would include vehicles with winches, refrigerators, large stereos or other accessories that place significant demands on charging systems and batteries. That would also include vehicles that don't have charging systems, like some race cars. Many consumers get hung up on making a purchase based on the rated cold cranking amps (CCA) of their battery, assuming more is always better, even if many vehicles in warmer climates never spend any time in the cold temperatures where CCAs are typically measured. The important thing to remember is that the battery you choose should meet or exceed the cranking requirements of your engine. Also, don't forget what we mentioned about deep-cycling. More cranking amps doesn't always mean a battery is designed for deep-cycle use, so if that is also a factor in your purchase, make sure you make the appropriate choice. This video also explains the difference between our various batteries and what might be most appropriate for your application. Whatever battery you choose, make sure you inspect it for physical damage when you buy it, especially if you shop online. 2. Maintain proper battery voltage whenever possible. Fully-charged, our REDTOP batteries (and 34M BLUETOP) will measure about 12.6-12.8 volts. All other BLUETOP and all YELLOWTOP batteries will measure about 13.0-13.2 volts. Whenever any battery is discharged below 12.4 volts and left to sit, sulfation begins to form in the battery, which diminishes both capacity and lifespan. If your vehicle is going to sit unused for extended periods of time, consider using a quality battery maintenance device or at least fully-charge and disconnect the battery when the vehicle goes into storage. Periodically starting stored vehicles may have no positive impact on battery voltage. In fact, it could actually do more harm than good, if the charging system does not have enough time to replace the energy that was used during storage and starting. Boaters should also make sure they fully-charge their batteries as soon as they come off the water, instead of waiting until the night before or day of their next outing. Frequent short trips and accessories like car alarms and GPS-based systems can also discharge a battery over time, even in vehicles that see regular use. If your regular commute is relatively-short or your vehicle has a car alarm or other accessory that stays on when the car is off, make sure you measure your voltage periodically. 3. Alternators maintain batteries, chargers charge batteries. If you do find yourself in a situation where your battery needs a jump to get your vehicle started, there is a good chance your battery has been deeply-discharged. Most vehicle alternators and charging systems are designed to maintain batteries, not recharge deeply-discharged batteries. If you rely on your alternator to recharge your deeply-discharged battery, you may fall into a cycle of dead batteries and jump-starts, until either the battery fails (expensive) or the alternator fails (really expensive). If you jump-start your deeply-discharged battery, fully-recharge it with a battery charger as soon as possible. Many of the "bad" batteries returned to us now are just deeply-discharged and work fine, when properly-recharged. This parallel charging technique can recover many deeply-discharged batteries, but if you still have issues, take your battery to a battery specialist. These experts can attempt to fully-charge and test your battery and some will even perform this service for free. If you have any questions or concerns about your battery that can't be answered on our website, send us an e-mail at info@optimabatteries.com or call us at 1-888-8-OPTIMA. If you can't remember that address or number, just check your battery. We print them both on every battery we make.